By now, most people have heard of 3D "printing" in construction even if they've never directly used it. So it should shock no one that 3D scanning software exists as well. This technology measures space and dimensions of multiple points on the surface of a physical object and assigns coordinates (X,Y,Z, etc.) to them. These measured points are known as a point cloud. While these point clouds by themselves aren't too exciting to look at (they usually just look like a data file), they can be combined with 2D programs like computer applied design (CAD) to create 3D images of the physical object actually scanned. If this sounds like the stuff of science fiction, the technology has been around and used for the better part of a decade. 3D scanners have been successfully used to map parts of the human body, catalogue crime scenes, and observe infrastructure health. Depending on the type of scanner, its laser line can scan images from hundreds of feet away accurately and within seconds. And increasingly, they're being used in the construction industry. Depending on the scope of the scanning job, time spent utilizing this technology can range from a few hours to a few days. The accuracy and clarity of these scans can save almost ten percent of the time expended collecting information using traditional equipment. However, it should be noted that 3D laser scanning in construction is not a cheap process. Nor is it appropriate for all construction projects. 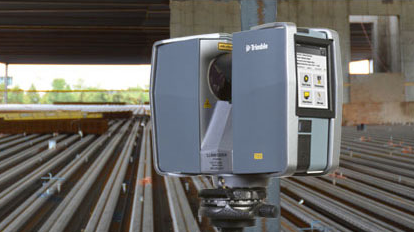 But for firms working on bridge, road, restoration, or complicated building system projects, these scanning systems can save time and money if used effectively. To get the most of this technology on such projects, firms should first determine how often it will be utilized. If it's occasionally, than they may be best served by hiring contractors who offer "soup to nut packages". These contractors will do actual scanning, combine point cloud data with compatible 2D programs, and produce visible 3D images for clients. Be aware that when scanners have to be transported to sites (usually the case on construction projects) prices go up. Scanner contractor prices are also affected by the size of the object and desired clarity of the image, and whether or not pre-scanning prep work has to be done at a site. These scanners are now available in portable form, and there are more options here than ever before. While the scanners themselves are not difficult to operate, the process becomes more challenging in selecting accompanying 2D programs for point clouds. That, plus varying costs depending on components make this type of 3D laser scanning in construction probably better suited to larger firms with robust IT and engineering departments and larger technology budgets.